Are you allergic to bee stings? Probably not! Most people who think they are allergic are not. A bee sting victim typically has localized pain and burning, redness, itchiness, and swelling at and around the site of the sting. This is not necessarily an allergic reaction but simply the victim's immune system responding to the bee venom. This is rarely dangerous. However, a person who is stung several times may be in danger due to the amount of poison and immediate medical attention is warranted. These reactions are extremely dangerous and require immediate medial attention. Call 911 and get the victim to the hospital. Your medical doctor, Mayo Clinic, HealthLine, and WebMD have more information on bee sting allergies. 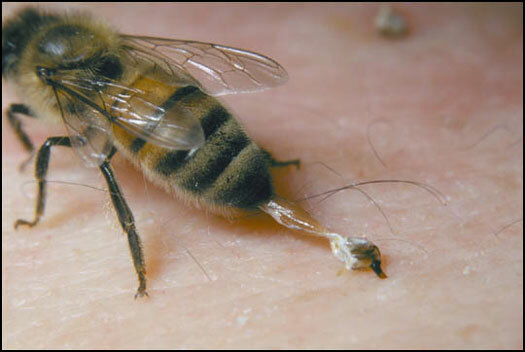 As shown in the photo above, a honey bee stinger usually stays in the victim's skin and the bee soon dies from the trauma. A honey bee stinger has a sharp, barbed shaft topped by a venom sac and muscles that pump poison sac contents into the skin. 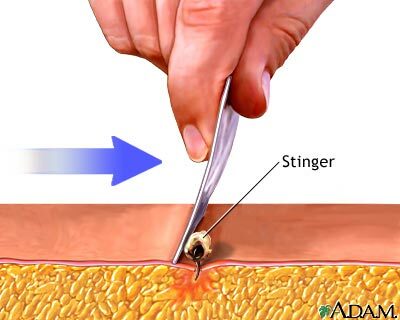 To reduce the amount of poison that is injected into the skin, the stinger must be removed immediately. Do not use fingers to pinch the stinger out or use tweezers or any other tool that would squeeze more poison into the skin. Instead, promptly scrape the stinger off with a card, coin, or fingernail. If a card or coin is not immediately available, don't waste time to find one. Instead, simply use a fingernail to scrape it out. Applying Benadryl cream, mud, or a paste made of water and baking soda can soothe the sting. They will not treat an allergic reaction! The author of this page is not a physician and does not pretend to be one on TV.